Last week I received an advisory regarding the urgent patching of Windows servers used on the corporate network due to the Wannacry vulnerability and that all non-compliant machines had to be patched with MS17-010. Now I use Windows Servers quite a bit in my day job for reproduction of customer issues but I knew the majority of VM’s I used were either Linux based or VMware Appliances. I did not have any physical boxes so this made the information gathering exercise easier. After some internal dogfooding using vRealize Configuration Manager (part of vRealize Operations Suite), I ran a vCenter Guests collection and was then able to get a complete list of Windows VM’s which would require patching. The final total was 35 machines spread over 3 OS types – Windows Server 2008 R2, Windows Server 2012 and Windows Server 2012 R2. Now I could have copied the required MSU files to each server and executed the patching process manually but I wanted to make this more interesting so I decided to flex my PowerShell skills and semi-automate the process. Based on the code output from WUSA, script either reported success or fail. The code iteratively worked through each machine and once the .txt file had been read the script would exit gracefully. After a few coding iterations I created DeployPatch_MS17_010.ps1, the screenshot below shows the script running on 1 out of 26 machines. 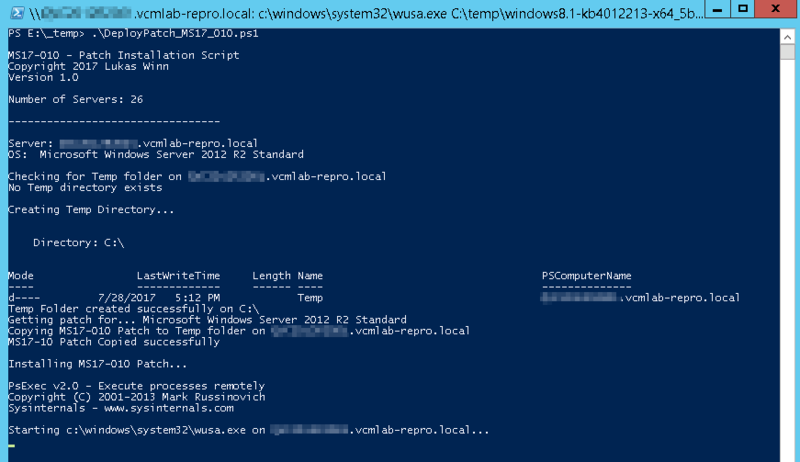 Note: I have had to obfuscate the VM name as this was a customer repro VM. To follow on from this I plan to create 2 more scripts which will detect which machines require reboots and then detect that the patch is installed correctly and is now compliant. I may also make additional changes to v1.0 to allow for pre-selection of .txt file plus other enhancements.